Includes a free bonus CD containing a 78-minute illustrated talk by the conductor. You cannot stress too strongly the spell that Vienna cast over Mahler from the earliest age. You can almost imagine him as a child like a Bohemian Jude Fawley metaphorically stopping his wagon to look at the sun glinting on Vienna's, rather than Oxford's, windows in the distance and dreaming of greatness. The difference between Hardy's fictional doomed hero from Wessex and our real-life doomed hero from the backwoods of Austria-Hungary is that "Gustav The Obscure" would achieve everything that "Jude The Obscure" did not. Not only did he get to the city of his dreams but also for ten tempestuous years he was the most famous man in town after the Emperor. Only then did the city throw him out. In Jude's case it was the curse of class prejudice that excluded him. In Mahler's case it was race prejudice, laced with the bitter poison of envy, that was his downfall. But the spell never broke. In spite of it all Mahler returned to die in Vienna and his bones lie there now. This is all relevant to Benjamin Zander's conception of the Fifth Symphony because, in the accompanying talk, he sees the Scherzo at the centre of the work's tripartite structure: a musical evocation of Mahler's attitude to the city at the time of composition. This is the city of café houses, waltzes, the opera, The Ring. All of these Mahler loved and celebrates, Zander reminds us. Behind all this, however, he wants us to remember the pressure of cynicism, anti-Semitism and the "straws in the wind" for the end of the vast Empire that Vienna represented and which Mahler must have sensed. I won't summarise the rest of Zander's talk. Suffice it to say that it is strong on detail and ideas in all other aspects of the symphony and both old and new Mahlerites will find something to stimulate them. You could argue that music should be allowed to stand alone without this kind of commentary. That the conductor is imposing himself on his listener too much by telling him what to think where all his "talking" should be done on the podium. If you believe that then don't listen to the talk disc at all, or leave it until later. I must say, though, that it is possible for you to come away from the talk and hear Zander demonstrating his ideas in the performance which I didn't feel was the case to the same extent in the accompanying talk for his recording of the Ninth. But I do have my reservations about reference to Mengelberg's stated opinion, one that seems to be gaining more currency in recent years, that the much-loved Adagietto fourth movement is a musical "love poem" by Mahler to his wife Alma. For one thing there is no evidence to support this from the two people who matter most - Alma and Gustav Mahler. All we have is Mengelberg's word. If it really was the case that Mahler sent this music to Alma as token of his love for her then I think she would have told the whole world about it, as she did other music meant for her. What is clear from Zander's detailed, closely observed and meticulously prepared performance is that, like all the best interpreters of this work, he recognises the crucial importance of stressing contrasts within and across the five movements. The Fifth Symphony presents the musical equivalent of split personality. Musical polar opposites are presented side by side - tragedy and joy, depression and mania, pain and pleasure, despair and hope, etc. These opposing attitudes are held together by a structure that charts a course out of despair towards joy but with a journey that is the story of struggle. The first two movements form Part I whilst the last two form Part III. The third movement forms Part II by itself and it's in this movement that the opposing forces appear to meet and become transformed, rather than resolved, into what Mahler thought of as a portrait of a man of the world - or Vienna standing for the world, according to Zander. Resolution must wait, of course. That should signal something that is important to note about this new recording. It is very strong indeed on the inner detail - the "cogs and pulleys" of the work. Both the performance and the sound recording work hand in glove with the concept of illuminating what makes the Fifth tick with Zander almost bringing a lawyer's eye to the small print in Mahler's contracts. However, rest assured this ear for detail is never at the expense of the overarching structure, never at the expense of feeling either. But Zander never imposes himself. He is a conductor who lets the music speak for itself and with an orchestra prepared to follow his every request we are the beneficiaries. 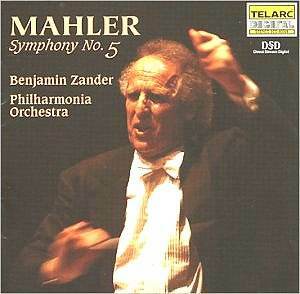 Indeed, this is the best example of Zander's Mahler I have yet heard. The funeral march that opens the first movement is dark-toned and leonine, ready to spring, quite threatening. There is steel in the grimace of the strict rhythmic pull too. However, in his talk and notes Zander shows he has gone back to Mahler's own piano roll of this movement, made in 1905. He points out the very particular way Mahler appears to articulate the dotted funeral rhythm and you can just hear this in the performance where it adds a distinctive aspect. He projects the first Trio at bar 155 without the hysteria that can disfigure the passage under other hands and so make it seem to spring naturally from the march so that when the march comes back we are aware that it never really went away thus unifying the material. Praise here for principal trumpet Mark David who drags us back to earth with his instrument acting like a hypodermic full of strychnine into the symphony's body. Indeed in this whole movement the solo trumpet must both initiate and react to drama and knowing the difference distinguishes this particular account of the solo part running through the movement. Following the great collapse climax at bar 357 Zander finally pulls the music down to the depths of despair admirably. But there is a sting in the tail. The final pizzicato note is reproduced here with startling force, like something out of Bartók. In the second movement Zander is careful to project the ebb and flow that makes this movement so involving. I have heard recordings where the conductor hasn't thought through the implications of what is going on, doesn't appreciate the need to carefully grade dynamics and tempo changes so you know where you have been, where you are and where you are going. In these cases the result is just a lot of noise punctuated by pauses for breath. Zander certainly coaxes the Philharmonia's woodwind choir to chatter and cackle in those extraordinary figurations Mahler keeps throwing in. Also the reproduction of the pizzicato notes that go with them make for a nervy quality. The delivery of the chorale passage at the climax has secure, liberating brass and forms the organic centre of the movement. But it is interesting that, for me, Rudolf Barshai in his Laurel Records version shifts the emphasis of this movement over to the collapse that comes a little later. An illuminating touch, I found - one of the clinchers in my stated belief that his was the finest Mahler Fifth currently available. I have already mentioned Zander's view of the Scherzo as Mahler's complex interaction with Vienna. You need to hear his talk to get to grips with what he means and hear his performance too. All I will say is that the arrival of the movement in the recording does the most important job of all and that is mark the emotional shift Mahler clearly had in mind and which is so important to this work as it proceeds. The mood is certainly transformed and "Jocund day stands tiptoe on the misty mountain top," as Romeo might have put it. In this movement there is also that important solo for the principal horn. As with his trumpet colleague in the first movement, he must be initiator and reactor, but he must also be storyteller in those quiet, reflective passages and must know when each role is relevant. Laurence Davies certainly does. Overall Barshai is one and half minutes slower in the Scherzo in his recording than Zander and in so doing makes the music breathe even more. Mahler, after all, worried that conductors would take it too fast. Zander certainly does not do that, but maybe his ideas of the "hidden agenda" behind the movement have made him more pro-active. All change emotionally again for the final two movements that make up Part III and Zander certainly delivers change once again. He also recognises the importance of the vexed tempo question in the Adagietto fourth movement. I would like to think a change from the depiction of this movement as funeral music is at last under way among conductors, but I'm not banking on it. Zander admirably outlines the tempo question himself in his talk. To summarise my own view, even leaving aside the evidence of contemporaries whose notes confirm a more animated interpretation from Mahler the conductor, there's the firm belief that this movement is a "song without words" to be played in line with what the human voice could cope with. Also in the last movement Mahler recalls the Adagietto and this works best the closer it sounds to the way we heard it first. Since this reprise is, by nature of the movement it's contained in, somewhat quicker, an Adagietto nearer in tempo reinforces the point Mahler is trying to make - that these two movements are indeed intimately connected. A quicker tempo does not mean the loss of expression, of course. It just means you get the right kind of expression to the one you may have been used to. Zander is keen to stress the rubato possible in this music particularly and especially at the start; more than you might expect, in fact. By so doing he can also slow down more at the end. I was a little disappointed Zander doesn't appear to observe Mahler's marking "attacca" at the very end of the Adagietto but neither does anyone else really - apart from Leinsdorf on RCA. However, the last movement here is an unhurried celebration with enough spring in its step to allow the witty twists and turns Mahler gives us to win through and, as I have outlined, form a link between this movement and the one before it, stressing structural integrity to the end. In his absorption of every detail of the score, allied to zeal to bring them out, Zander's is a recording of Mahler's most wide-ranging work that should be on every collector's shelf. It is worthy to be ranked alongside Barbirolli (EMI 5669102), Shipway (Tring TRP 096), Schwarz (Everest EVC 9032)), Bernstein (DG 4236082) and Tennstedt (EMI 7498882) - all comparable in their different ways. Conductor and orchestra are served by a recorded sound that is superbly balanced and dynamic enough to encompass every aspect of the score. I have not had the opportunity to hear the recording in "Surround Sound" but it is worth pointing out that the work was taped using that system. Zander's recording of this symphony goes to the head of a very select list and I strongly recommend you add it to your collection. In the April reviews I featured Rudolf Barshai's recording of this work on Laurel Records (Laurel-905) and stated that I regarded it the finest version of the symphony now available. This personal opinion excited some comment. Not least from one fellow critic who saw fit to caution me in a public forum for showing "silliness that makes so much criticism irrelevant and/or unbelievable". Of course that critic is entitled to his opinions. But I am too, and you may rest assured I will carry on expressing them undeterred. If I believe that a recording of a particular work is the finest currently available, then I will not fail to say so over and over again. In so many ways Barshai's version is hors concours and you should re-read my review to see why. Listening to these two recordings close together is like seeing two pilots flying over the same landscape. Barshai is at a higher altitude than Zander but both men have the same eagle eye for what is below. We the listeners are the richer for having the opportunity of owning both versions. I have paid enough compliments to all departments of the Philharmonia Orchestra for you to know that here is an account of the Fifth to go with the greatest before us. Zander does have the better orchestra in terms of range, colour and basic security. But Barshai's young Germans also score highly in terms of more caution thrown to the wind as well as giving some professional orchestras a lesson or two in other areas. A case in point would be the two principal horns. Compare Laurence Davies with the young player in the Barshai recording and it's like matinee idol against ingenue, Bjorn Borg in his prime against the teenage Boris Becker. So many details like that emerge in the playing it's really invidious to compare so I would say glory in the considerable virtues of both. This is one of the finest recordings of Mahler's Fifth now before us. Superbly interpreted, played and recorded.